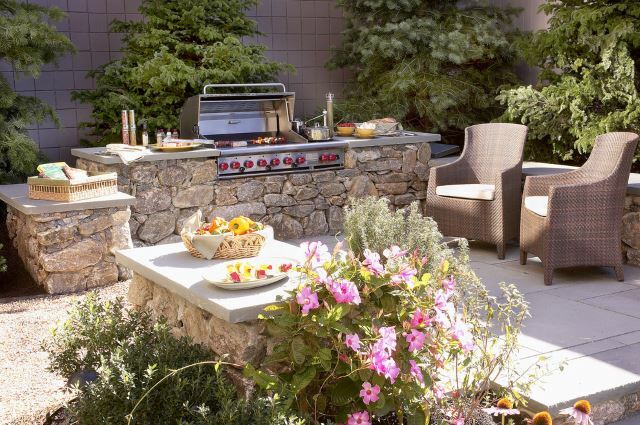 Warm weather inspires people to enjoy the outdoors, and nothing is more relaxing that outdoor cooking areas where you can spend time with family and friends. 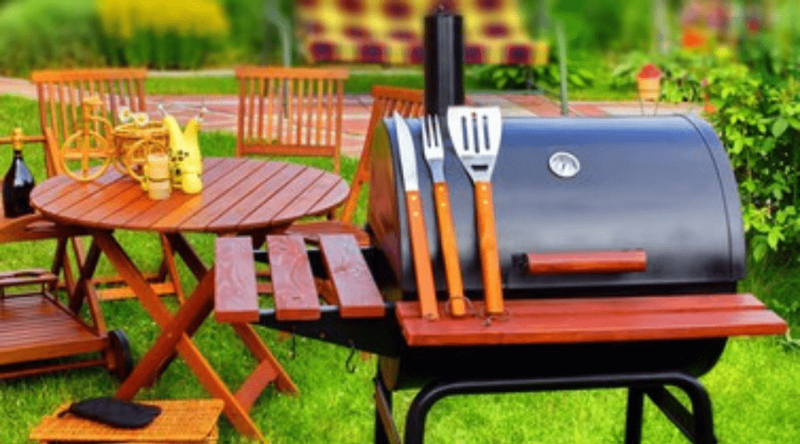 Perhaps you prefer to BBQ outdoors to help keep your kitchen cool on hot summer days, or perhaps you simply enjoy being out in the middle of the action where you can cook and socialize all while keeping an eye on the kids. 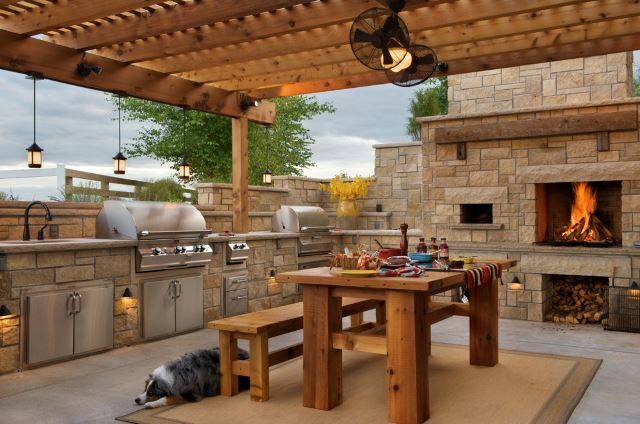 No matter your reason, the list of backyard bbq area design ideas provided below are sure to inspire your existing space and what you are grilling on. 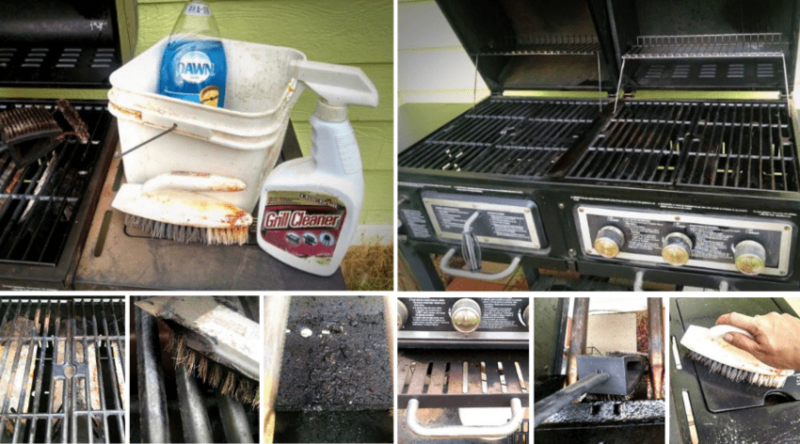 If you have the space to build in a grill and cooktop, it is well worth it. This helps open up deck or patio space for entertainment. 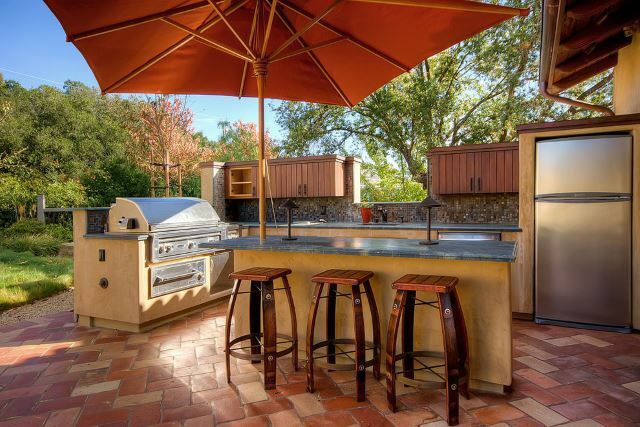 Plus, it provides more of an outdoor kitchen look and allows for counter space and areas to take advantage of. 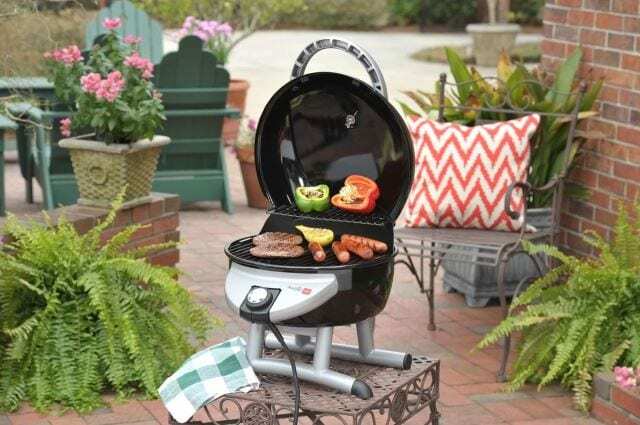 This is an excellent design in that it provides a perfect place to set your grill without having to build it on, and also has a sink so you can do all your meal prep and cooking in one place without having to go back indoors! Even if you don’t have a large space, you don’t have to sacrifice your grill size to make up for it. 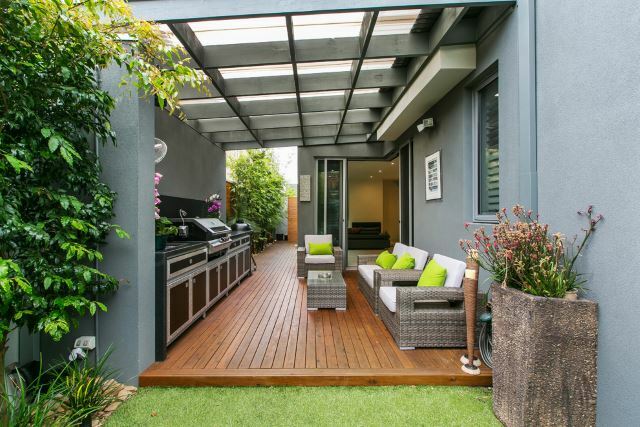 A small pergola and bricked counter built-in it a place to live, and you can use the rest of your yard as an extension of your cooking area. Simple charcoal grill designs like these are a must-have for smaller spaces such as apartment balconies, or townhouse patios. They are classic in design and easy to use- plus they make food wonderful! 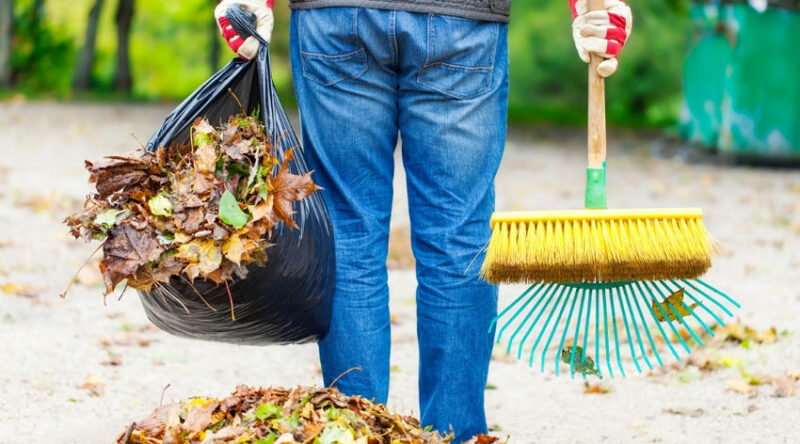 Personalizing your space is such a fun way to enjoy your surroundings, but most people don’t realize how many things you can truly customize. 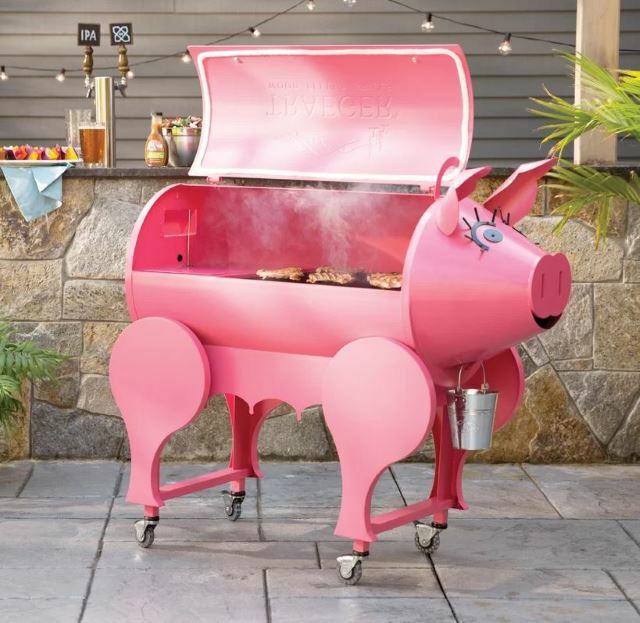 This piggy wood pellet grill is the perfect place to cook up for favorite cuts of swine (and bovine) and is sure to make everyone laugh. If you build in a frame over your sitting areas, you provide many options through the seasons for both interest, and well as protection from the elements. Grow twining vines, hang annual baskets, or even cover with fabrics. 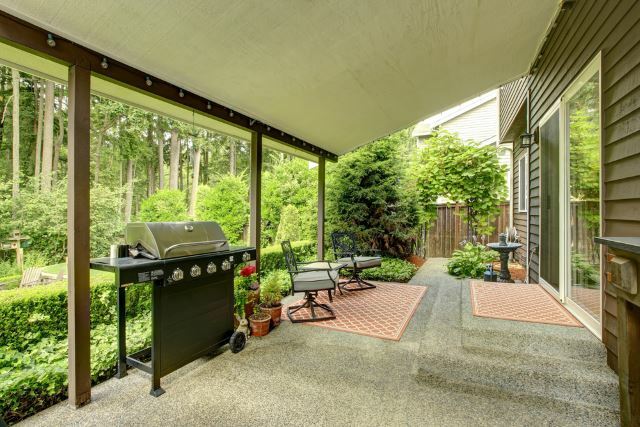 Extend your living area with a true outdoor room that includes everything you need to enjoy the weather year round, and have protection and privacy. 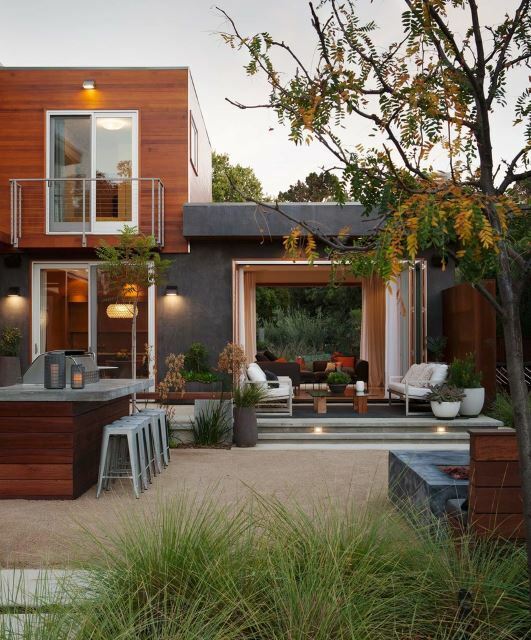 Many of these designs provide ways to close off the space completely as needed. 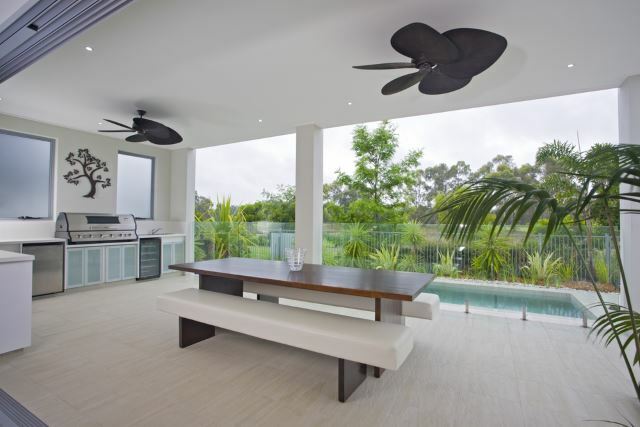 Create your own poolside oasis with an extended living space that provides breezy walkways and spacious sitting areas. This is the perfect place to watch the kids swim as you ready dinner. 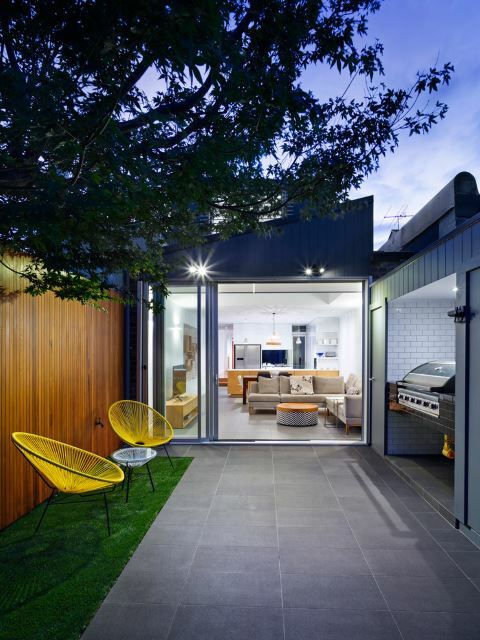 Even if you don’t have the property to provide a true extension of the house to an outdoor living area, you certainly can work with what you have. 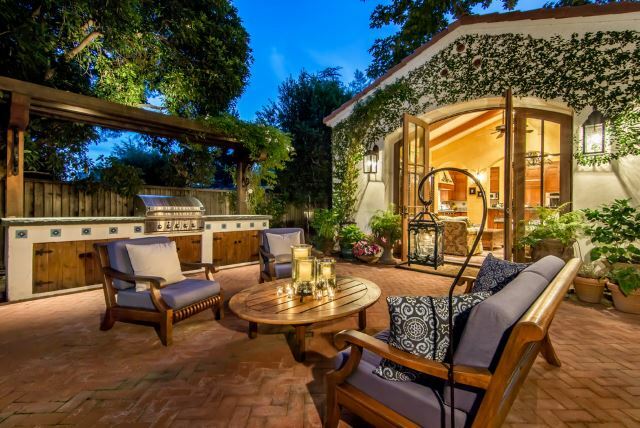 An easy shady nook was created using a simple covered patio design on this home for protection and privacy. These little tabletop grills are the perfect portable solution for campers, or even for easy meals outdoors when its a bit late for charcoal, or you’ve run out of propane. It also can quickly cook up your veggies sides without flame while you grill up your meat if you want to avoid putting them in the same areas. 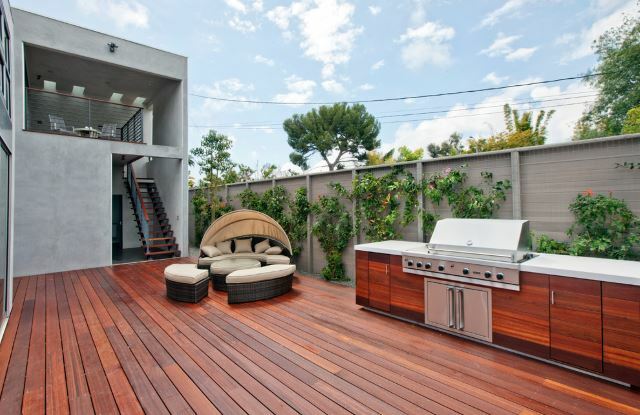 There are many appliances available for outdoor use, making the creation of a space like this easier than you think. Even furniture is made to look like something you would place indoors, but are free to leave out. The addition of large doors can make your indoor space a part of the outdoors with very little effort. 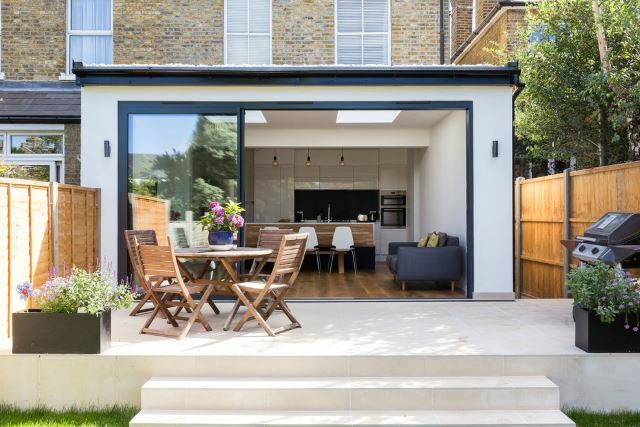 Bring the peace of your property into your living areas with simple architectural approaches. 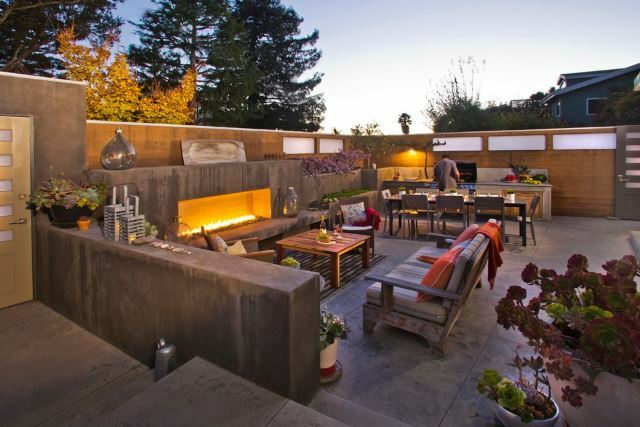 The simple stucco allows the rest of the decor to be highlighted and brought to your attention every time you take advantage of this outdoor space. 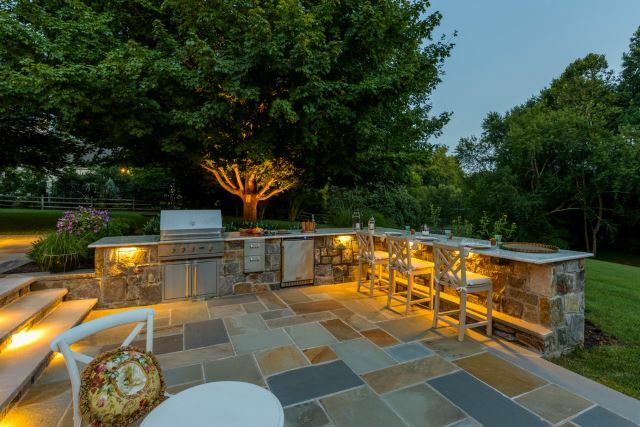 A fireplace and cooking area are open to allow easy conversation across the area. 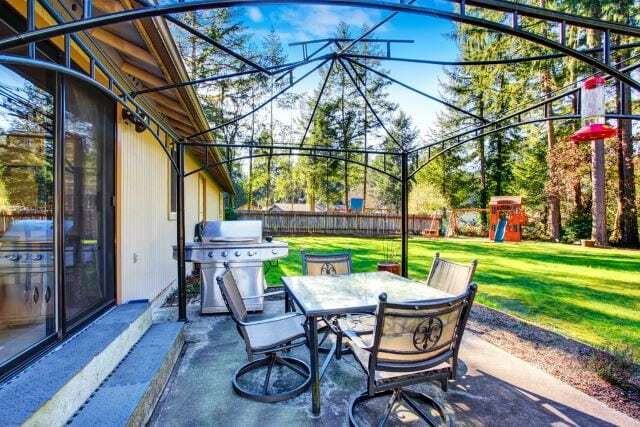 This patio space is practically move-in ready and has everything you need to sit around, drink in hand, and have an excellent conversation with your chef. The wood stove is even available for your own brick oven inspirations. A built-in grill and cooking area to this wall is out of the way and easily accessible when needed. If you have a small area to work with this is an awesome solution, and a great way to protect your items. 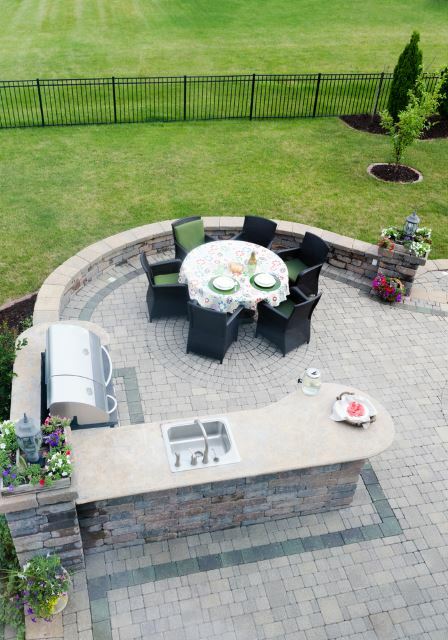 Take advantage of all your landscaping and place your grilling spaces out where you can watch and be part of all your entertainment. The walkout living space is especially nice to take advantage of. 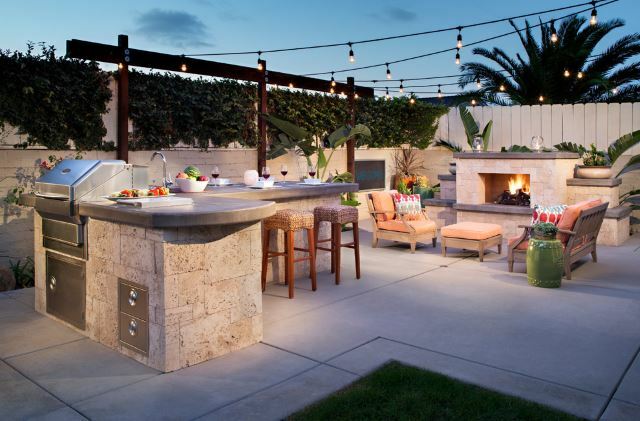 Placing the grill to face out to the entertaining area, and providing great lighting is the perfect way to include the cook in all the social activities. Plus, as the evening deepens, draping lights help bridge the space between the cooking area and fireplace. Again, a large sliding door can help open up your indoor spaces to provide a larger look to your small backyard spaces. Cooking areas can be easily tucked into recesses in the wall as well to keep from taking up too much space. The architect of this design mimicked the standing chimney of a house long gone to provide a peaceful, romantic feel to the spot. With cooking spaces on either side of the fireplace, this is a place anyone would want to gather. Make your area look even larger than it is by providing a walkthrough decking area leading from the front of the house to the back. This design provides a year-round entertainment spot surrounded by the landscape. 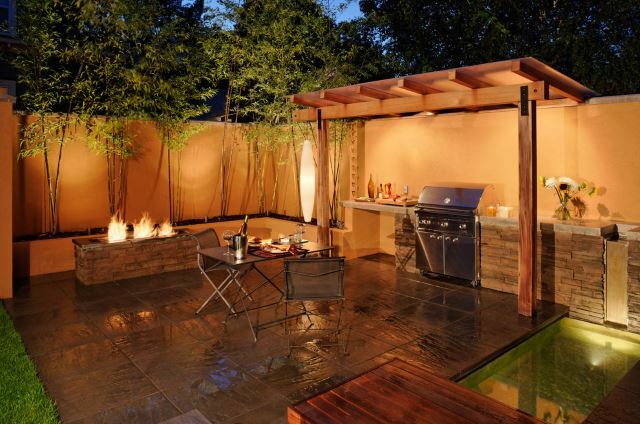 Your lighting choices can influence how and when your backyard grilling spot will be used. Simple spotlights that highlight the areas you need to see in order not to take away from your surroundings is the perfect goal. Even if all you have is a small balcony, that doesn’t mean you have to settle for boring. Take advantage of your elevated views, and provide simple extensions of your decor for a relaxing place to unwind. 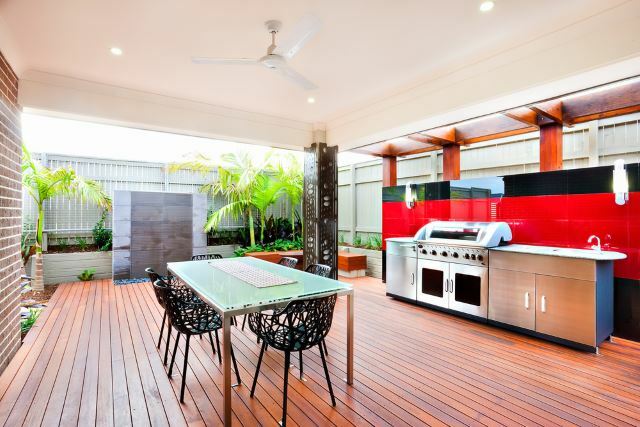 A grilling area is often a popular spot to have a few cold drinks while you wait for your BBQ masterpiece to finish. This simple bar allows for easy chatter, and the fridge in the background keeps cold drinks at hand. Nothing is more relaxing than sitting back and enjoying some quiet after a long day of work. 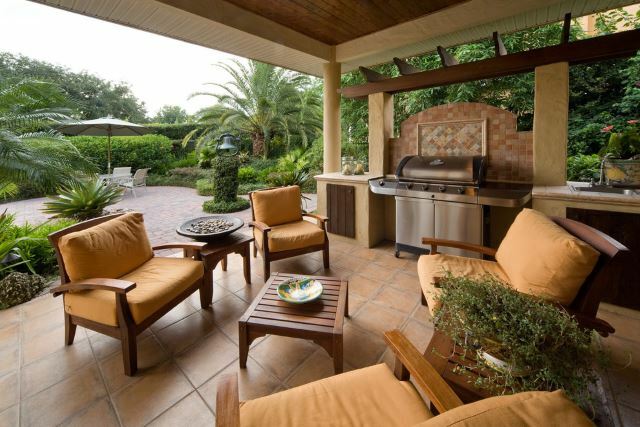 Your choice of patio furniture creates a welcoming and peaceful experience whether you are entertaining, or simply taking advantage of it all on your own. 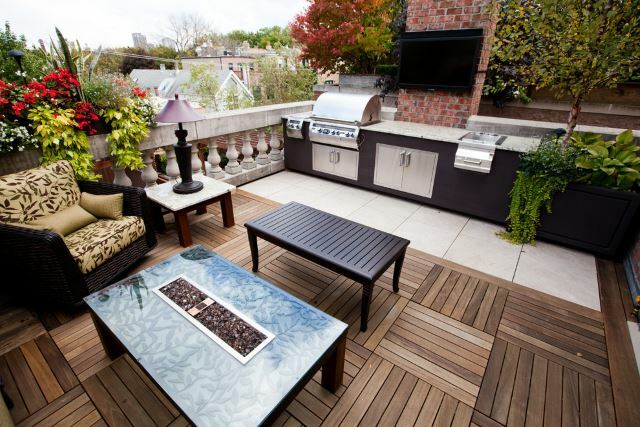 Big city living often dictates small outdoor spaces. But that doesn’t mean you have to sacrifice comfort and decor. 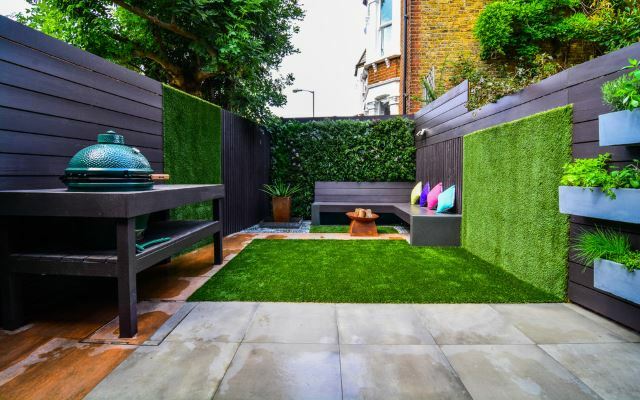 Artificial turf is often an excellent option as a lawn to add a bit of greenery to your BBQ spot. 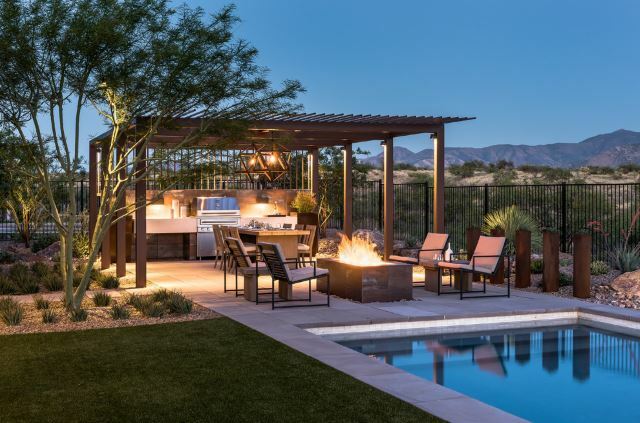 Pergolas aren’t just a Southwestern thing anymore.They provide sturdy structure and protection to your outdoor spaces, and are very stylish to boot. 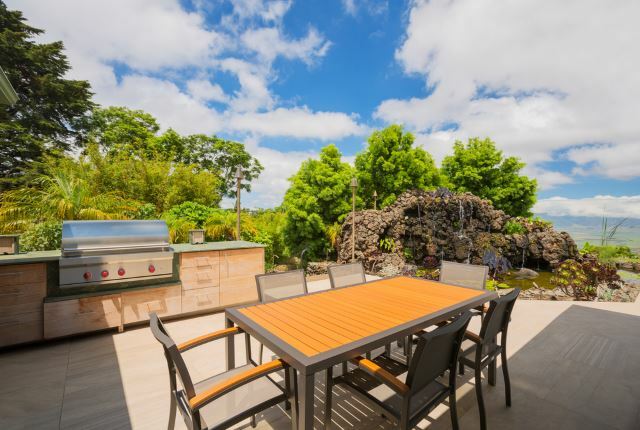 This landscape provides the best of it all with a place to relax, cool off, and enjoy a good meal with friends and family. The simple features of this space is both relaxing, and inviting. The water feature is a nice touch and provides a tranquil feeling. 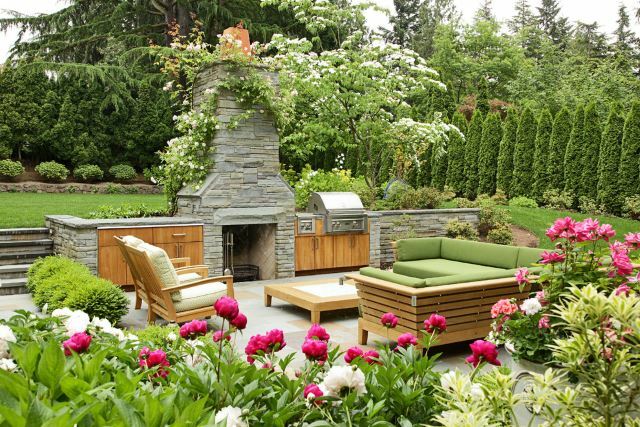 All you need is some outdoor furniture to complete the look. 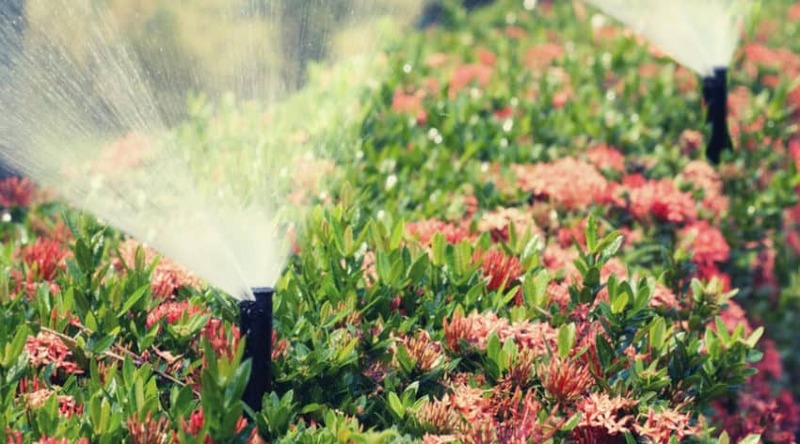 Many suburban homes have a narrow side yard that often gets overlooked. 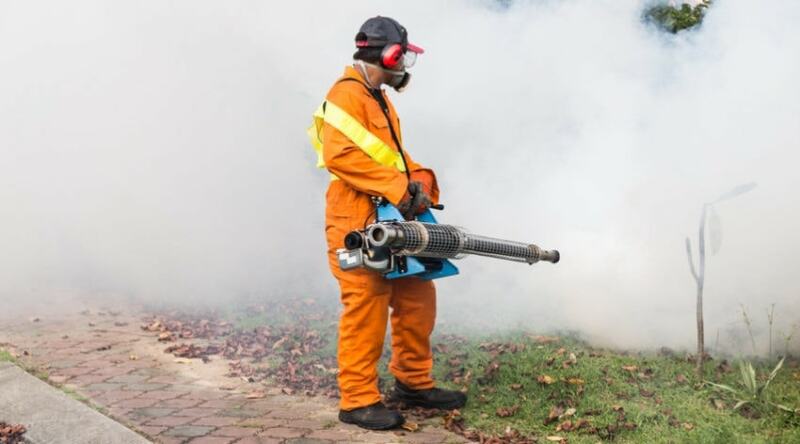 However, they are unexplored territory in many cases that can provide a private, and solitary space for cooking, eating, and simply relaxing and enjoying the outdoors. As we’ve seen above, never underestimate the welcoming walkout of large doors when transitioning from an indoor living space to an outdoor. Easy cooking access and relaxation awaits under the stars, while a welcoming inside area awaits. Even the concrete jungle of the city holds warm, and inviting spaces to cook and entertain within. 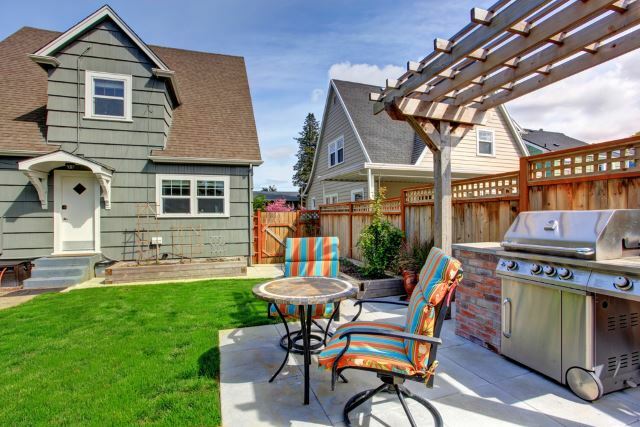 Tall fences block out the noise and sites of a busy surrounding to provide a personal space to call your own. 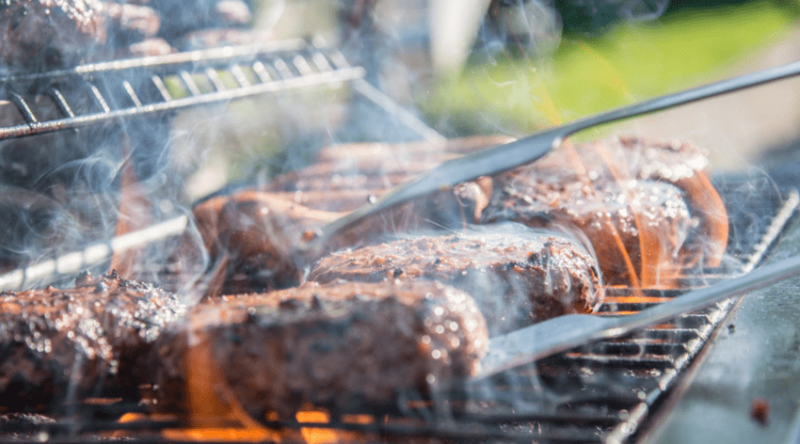 If you love to BBQ and entertain, then the choices that have been showcased above should have to planning your space for entertainment and culinary cuisine! 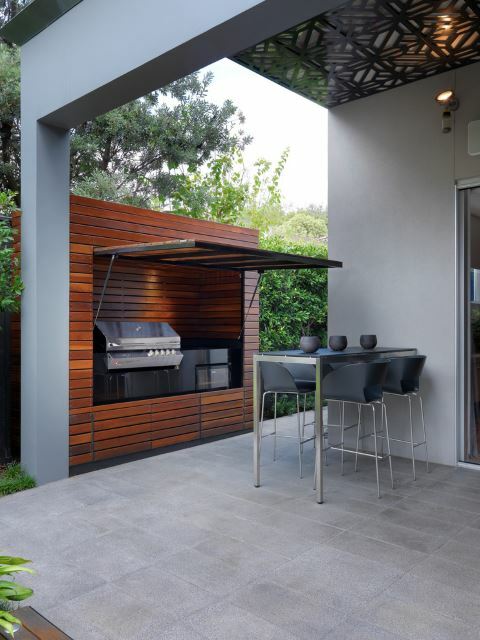 Whether you are searching for the perfect grill as an addition to your area, or needed some inspiration of how to take advantage of the space you have, there is plenty to consider above. We’d love to hear what was inspiring to you below, and which designs are your favorites. And, as always, please share!